Title: Little Blue Dots in the Hubble Space Telescope Frontier Fields: Precursors to Globular Clusters? For example, the “Green Pea” galaxies were discovered by citizen scientists, who noticed that these galaxies don’t look much like traditional early-type (elliptical) or late-type (spiral) galaxies. (See this page for a quick primer on the differences between some galaxy classifications.) Instead, these Green Peas look… well, small and green (Figure 1). This led to a discussion forum thread title (and eventually a Hubble Space Telescope proposal subtitle): “Give peas a chance.” The name stuck, and perhaps more importantly, Green Peas were found to be low-redshift analogues to high-redshift galaxies called Lyman-alpha emitters, which give us important information about the epoch of reionization. Figure 3. One of the Little Blue Dot galaxies. From Figure 2 in the paper. 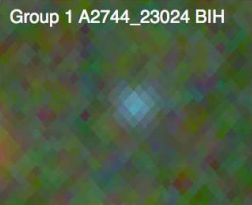 The LBDs don’t look much like other galaxies we’ve observed. They’re about 10,000 times less massive than the Milky Way, with stellar masses less than solar masses. But they’re also forming stars at an incredible pace—about 10,000 times faster than the Milky Way forms stars! It’s hard to overstate how ridiculously quickly star formation is occurring in these galaxies. In fact, if the star formation rates have been constant, the galaxies must have formed within the last hundred million years or so. (That’s younger than the Earth!) Also,they must be very gas-rich in order to form stars so quickly, since gas is needed to form stars. Figure 4. 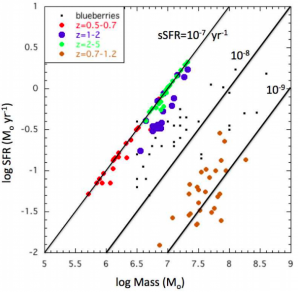 Star formation rate (SFR) as a function of mass for the LBDs (colored points) and blueberry galaxies (black points). LBDs are colored by redshift (low redshift, medium redshift, high redshift). Brown points are galaxies that look like LBDs but have lower sSFRs. What? Your LBD is evolving! The current paradigm of CDM cosmology predicts that large structures are built up from smaller building blocks, so maybe low-mass LBDs were the building blocks for the massive galaxies we see today? This very scenario has been seen in cosmological simulations, in which compact, highly star-forming galaxies called “blue nuggets” (another weird name, and one that isn’t even appetizing) evolve into massive quiescent galaxies. This might be a great model for LBDs… except these blue nuggets aren’t as intensely star-forming as the observed LBDs. What if LBDs are instead the ancestors of less-massive galaxies, like local dwarf galaxies? Unfortunately, past star formation has been measured in some local dwarf galaxies (see here for one example)—and even when these dwarf galaxies were at their peak star formation rates, they weren’t quite as vigorously star forming as the LBDs seem to be. This discrepancy might be because our measurements aren’t precise enough to measure very short bursts of star formation in whole dwarf galaxies. However, the strong bursts of star formation seen in LBDs could easily produce massive globular clusters within dwarf galaxies, even in a very short timescale. The authors use some quick calculations to show that LBDs could produce globular clusters of up to a million solar masses, about the same as some of the most massive globular clusters observed in the nearby universe. Furthermore, the clusters produced by an LBD would make up a large fraction of the total stellar mass in the LBD, a scenario that’s consistent with what we see in local dwarf galaxies. So there you have it: LBDs might be the progenitors of massive globular clusters! The evidence is a bit circumstantial, but it’s not a bad guess. More work will be needed to verify this link, and hopefully we’ll learn more about these strange galaxies along the way.